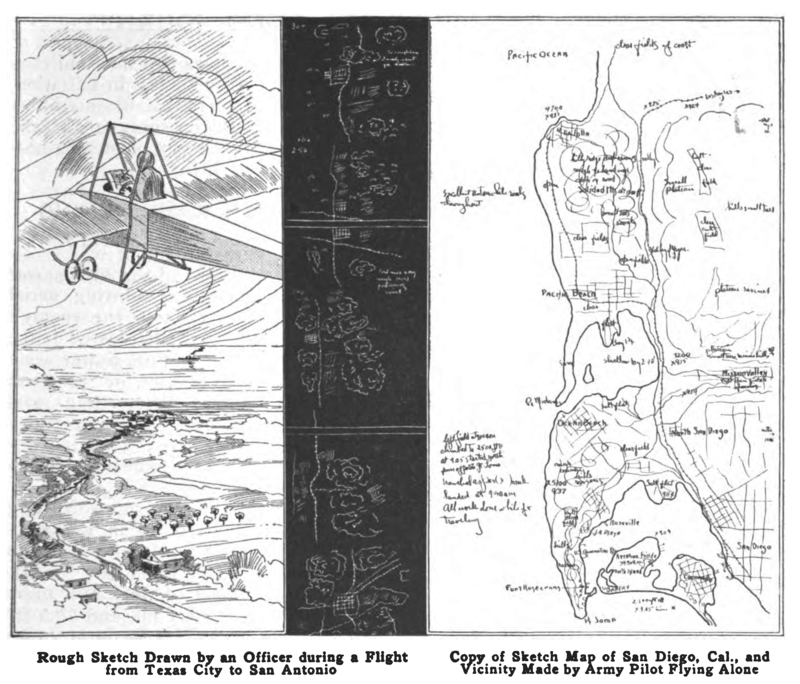 Several signal officers flying alone or as passengers were able to make usable sketch maps of the country below them, as they flew two or three thousand feet in the air. The practicability of making war maps from aeroplanes during aerial scouting expeditions into the enemy’s territory has recently been tested by the signal corps of the United States army and found entirely feasible. Several signal officers flying alone or as passengers were able to make usable sketch maps of the country below them, as they flew two or three thousand feet in the air. Two maps that were made during these tests are reproduced [above]. One of them is the rough sketch map drawn by Lieut. W.C. Sherman while riding as a passenger in an aeroplane with Lieut. Thomas DeWitt Milling on his record flight from Texas City to San Antonio. Tex., on March 28, 1913. It was drawn while they were traveling 56 miles an hour and, by means of the signal corps symbols, gives a clear picture of the country tover which they passed. Railroads, highways, streams. towns, woods. etc., are marked, and the figures on the lefthand margin indicate the aeroplane’s time. The original sketch is 12 ft. long and to scale, 6 1/2 inches equaling 10 minutes, and 1 in. equaling 1.44 mile. The other is a completed map drawn from a sketch of San Diego; Cal., and vicinity made by Lieut. J. D. Park while flying alone on May 3, 1913. a few days before his death in an aeroplane accident on May 9. The coast line and the topography of the country are indicated clearly enough to be of value to an attacking force, and at various points clear fields where airmen might make safe landings are marked out. Although the strip of country included in the map is 5 miles wide and 15 miles long, the entire sketch was made during a 35-minute flight from the aviation field at the south along the line of the railroad. At times the airman reached a height of over 3,000 ft. and from there was able to note the character of the country for 10 miles about. Popular Mechanics Magazine, Volume 20, Number 4, October 1913. John has dug some interesting material on war sketching here, complete with illustrations.